Occasionally, while at the Assisted Living facility where we do services each week, the Bookmobile is also there. The sight of that blue and white bus immediately brings back memories. I can remember vividly the first time I saw, and entered, the Bookmobile as a child. I was amazed that the Library had actually come to me instead of me going to it! Shelves of books were there for me to view and choose. I can even remember its distinctive smell...a strange mixture of diesel fuel and old paper. As amazing as the bookmobile was then, I was to find an even more amazing discovery in my teenage years. That discovery was that Life eternal had come down to me in the form of the Lord Christ Jesus. God had chosen to become a man. He willingly "made Himself of no reputation, and took upon Him the form of a servant, and was made in the likeness of men: And being found in fashion as a man, He humbled himself, and became obedient unto death, even the death of the cross," (Philippians 2:7,8.) He came and His salvation was now mine to choose. Thankfully, on one Saturday night in August 1973, I did. What happened to me then was more life-changing than if I had read every book in every library in every city. The King of all Knowledge entered my heart and I have found Him to be more faithful in every aspect of my life than I could have ever imagined. "He was in the world, and the world was made by Him, and the world knew Him not. nor of the will of man, but of God." The Syncopated Beat. . . In music, syncopation refers to rhythms which are in some way unexpected, resulting in an off-beat tune to the piece of music. Basically, it is a disturbance in the regular rhythm of the song, or accents where they wouldn't normally occur. Lest you assume syncopation occurs only in modern music, let me assure you it is not only found in ragtime, jazz, blues, funk, reggae rock and samba, but was also used by composers such as Bach, Handel, Mozart, Beethoven and Haydn. Syncopation can also occur when a strong harmony element is placed on a weak beat. I use this technique sometimes when I sing with my husband. In fact, one of his favorite choruses to sing, "I've Got the Joy, Joy, Joy Down in My Heart" is his favorite expressly because of my syncopated harmony. I guess to me the syncopation comes naturally. I can remember my sister telling me decades ago, "You are such a non-conformist!" She was right, I don't like things to be a certain way just because they have always been that way. If there is a good and valid reason for it, that's fine, but if not, then I am just as likely to go the other way. I've always liked being a little different, a little unexpected, a little "off-beat" from the rest of the song around me. As predictable as I am, every now and then I like to do something totally unpredictable. Which may explain why I changed my hair color two years ago. Isn't it wonderful to know in this ever-changing world in which we exist, that the Lord in which we trust is never-changing? He will always be in the future what He is today and what He has been in the past. And what is that? Faithful and True. and they shall be changed: but Thou art the same, and Thy years shall not fail." So often it seems when we are encouraging others, we often forget to offer that same encouragement to our leaders. "You did a great job!" just isn't something people think of saying to their boss, their community leader or even their Pastor. Most pastors would shrink from open praise, but there are some clear ways that we can each be real sources of encouragement to our pastors. This is the most important way you can encourage your pastor, if you commit to pray for him daily. Your pastor will face temptations to despair, to discouragement, to be distracted from what God has called him to do. He will be pulled in every possible direction from well-meaning and not-so-well-meaning church members. The time it takes in being a pastor can create temptations for tensions in his home. Knowing how much our enemy hates family, you can be certain he will viciously attack your pastor's family. Decide to pray for your pastor every day. I am willing to bet if he is a true man of God, he is praying for you every day. When the Lord brings him to your mind, let prayer be your first reaction. Your attendance at church will be more of a source of encouragement than you can ever imagine. Just show up! Be there, be on time, be attentive. Show as much attention to the service as you do to the ballgame the day before. Decide you will participate in the church services in any way the Lord leads you. Having ready volunteers on hand makes the role of the pastor even easier. 3. Follow the "Thumper Rule"
In Disney's movie, "Bambi" the little Rabbit Thumper said, "Mama always says 'If you can't say something nice, don't say nothin' at all.' "
If you can't say something nice about the pastor, his wife, his children, the service. . .then just don't say anything. Make your goal to fulfill Ephesians 4:13: "Endeavouring to keep the unity of the Spirit in the bond of peace." When others try to sow the seeds of discord in the church, be the one who stops it, not adds to it. Don't tolerate gossip in the church. Set the example for others of always treating your pastor with respect, and speaking of him to others with respect as well. Have the attitude that you are going to church to give to others, not to get from others. We are all to minister edification and encouragement to each other, not to consider the church our "filling station" to fill us up until we can get there again for the next service. Realize that every person we contact has some need that only the Lord Jesus can fulfill. Make yourself available to your fellow believers at church with the goal of building them up and lifting them up through the Lord Jesus. The Lord Jesus told His disciples, "My meat is to do the will of Him that sent me, and to finish His work," (John 4:34). We reap the most when we are doing His will, giving to others, meeting their needs, not looking out for our own. As I heard one pastor say, "The Holy Spirit of Love lives in our hearts and He is a giver, so we are to be givers as well." 6. Remember even our pastors need rest. Being a shepherd over the sheep is tiring work and at some point even the shepherd must sleep. Our pastors need some time to rest and be restored. Do not begrudge them a vacation or time away with their families as this can be a much needed time of rest and healing for them. They have borne many sorrows and troubles with those in need and sometimes just need time to be refreshed. Our pastors bear a heavy load and much responsibility. Let us do all we can to encourage them, to strengthen them and to help edify the believers in our own assemblies. Thou knowest that I love Thee. Jesus saith unto him, Feed My sheep." The thought of eternity -- time without end -- can sometimes seem so long. In fact, if I think too much on that one thought, my brain seems to hurt. Then adding the thought, "What will we be doing all that time?" makes my brain hurt even more. But I don't think we'll have any trouble finding things to do. This past Saturday we participated in the commencement services for Capstone Christian School. After the graduation, the school hosted a reception and I was able to meet the grandmother of one of the graduates. As I began chatting with this woman, I wondered what she and I might find to discuss. As it turned out, we chatted for quite a long time because we had a common bond. She was an Air Force nurse and has literally traveled the globe with her nursing career. She has worked in several different specialties of nursing, whereas I have always done Maternal-Infant nursing. In spite of that, we were able to have a great conversation based on the bond we share as nurses. We understood many things about each other, without even having to vocalize them. As we ended our conversation, I thanked her for her years of service as a nurse (she is now retired) and for her service to our country and I marveled that two strangers could stand and have such an animated, enjoyable conversation knowing so little about each other. Today, as I was thinking about that conversation, I began to think of the millions and millions of fellow believers who will be in Heaven. Each will have a unique story to tell and we will have a common bond with every single one of them. They will all be family to us. It is wonderful to be with family you haven't seen in a while and get updated on their lives. Heaven will be like the largest family reunion ever, except all the sibling rivalry will be resolved! There will always be another person to meet, another story to hear, another amazing bond to celebrate. Forever we will be exploring not only the wonders of our Lord, but the wonders of each other. No, I don't think we will have any trouble finding something to do. Our youngest daughter is a senior art-major at a local university. She has just finished another semester in which she has taken ceramics and our house is the beneficiary of her studies. 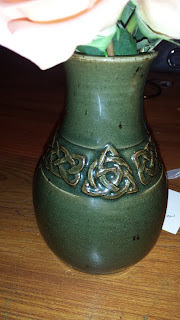 In fact, for Mother's Day, she presented me with a beautiful vase which she had made just for the occasion. Each bowl, cup, vase and urn she has made is the work of her own two hands, the product of her own mind. She has created the design, formed the clay, she has added the design elements and applied the glaze. The vase of which I am now the proud owner, is her workmanship. Just as the vase is the product of Emmie's work, we are the product of the work of the Lord in and through us. The Scriptures tell us that "it is God which worketh in you both to will and to do of His good pleasure," (Philippians 2:13.) There is not a moment in which He is not working in our lives to accomplish His will. We are either submitting to that working or hindering it in some way. Emmie did not give me a vase which she had not finish sculpting. She did not give me one she had not glazed nor one that had not been fired in the kiln. She took the vase through all the steps until it was completely and thoroughly finished. I know that it was the work of her hands, because the bottom of the vase bears her distinctive stamp, her mark. What an incredible thought that we are His workmanship, that forever He can showcase His children as the work of His love, His grace and His mercy. even as by the Spirit of the Lord." One day our daughter Emmie was helping our granddaughter Emma (yes, that does get confusing sometimes,) draw a picture for me. "If you draw that for Grannie Frannie," Emmie told Emma, "we'll put it on the refrigerator, and then she'll save it forever." Emmie knows this to be true because she knows I have drawings which she and her siblings made as young children. She is aware that those crayon colored pictures are treasured items to me. Emma drew the picture and it was promptly posted on the gallery of the refrigerator door. After an appropriate time of "showing" I took it down and stored it away in a safe place to keep "forever." Our Lord is also One who keeps remembrances. The Scriptures tell us that He puts our tears in a bottle and writes them in His book. They also tell us the prayers of all the saints rise up around His throne with the incense of the altar. He remembers His promises to us much more than we could ever try to remember them. The most important thing He keeps, is us. and no man is able to pluck them out of my Father's hand." "I Jesus have sent mine angel to testify unto you these things in the churches. I am the root and the offspring of David, and the bright and morning star. And the Spirit and the bride say, Come. And let him that heareth say, Come. And let him that is athirst come. And whosoever will, let him take the water of life freely. For I testify unto every man that heareth the words of the prophecy of this book, If any man shall add unto these things, God shall add unto him the plagues that are written in this book: And if any man shall take away from the words of the book of this prophecy, God shall take away his part out of the book of life, and out of the holy city, and from the things which are written in this book. He which testifieth these things saith, Surely I come quickly. Amen. Even so, come, Lord Jesus. The grace of our Lord Jesus Christ be with you all. Amen." I have often pondered what will be the precipitating factor to cause the Lord to return. My thoughts have often turned again and again to this passage of Scripture. I am especially struck by verse, "And the Spirit and the bride say, Come. And let him that heareth say, Come," as well as the last "Even so, come, Lord Jesus." I am reminded of how my brother and I used to ask our father to take us to a local swimming pool. Once we even went to the extreme of sitting in the hot car during midday of summer so we would be all hot and sweaty when he arrived home. Sometimes our cajoling, begging and pleading worked. Sometimes it didn't. Sometimes I think he gave in just so he didn't have to listen to us anymore. Perhaps the moment of the Lord Jesus' return will be when the children of the Lord have cried out enough "Even so, come, Lord Jesus." Maybe we as Christians just haven't gotten sick and tired enough of this world yet. One thing we can know for certain, just as the Lord heard the cry of the Israelites "by reason of their taskmasters; for I know their sorrows;" He knows our sorrows as well. He knows the world in which we live. He knows the battles we face each day and He hears our cries to Him. Thankfully, one day that trumpet will sound and our lips will no more utter the prayer, "Even so, come, Lord Jesus." I work night shift which means three days a week I sleep during the day. Like most night shift workers, I have tried to make my bedroom as dark as possible and I think I have finally succeeded. When the doors to my bedroom are closed, even during midday, it is so dark it seems as if it is 2 a.m. It makes it wonderful for sleeping. To help us deal with our allergies, my husband and I purchased an air ionizer. It has done a wonderful job eliminating the dust in our bedroom. In fact, it is almost like a miracle. My only fault with the machine is the tiny little blue light that signifies it is on. During the day, when the lights are on in the bedroom, the light is almost imperceptible. When the lights are off, however, that tiny blue light shining in all that darkness, is so bright, it lights up the whole room. That one tiny -- almost pinpoint of a light -- keeps me awake. I have to cover that light, to extinguish it completely. The blue light is more visible in the dark because it is dark. The darker it is, the more the light stands out in contrast. It reminds me of a very, VERY cold night we traveled home from visiting a dear friend in Arkansas. We had just passed through a long area of frozen fog into a crystal clear night. The stars against the black sky were incredible and it was the only time in my life I have seen a shooting star. The stars wouldn't have seemed so bright were it not for the blackness of the night. Sometimes as Christians, we look at the world around us and wonder at how dark, how evil some things have become. Things of darkness that once were only hidden now seem not only open, but prevalent and accepted. We can be tempted to despair, but let us remember that it is in these days of deep darkness, that the light of Christ in us will shine the brightest, will be the most visible. Let us not hide ourselves, our our light, under bushel, but let our lights shine and be a bright beacon of the truth to all around us. and men loved darkness rather than Light, because their deeds were evil." Much has been said over the years for "living well." I would imagine there are as many definitions for "living well" as there are blogs on the internet. Each person might have their own idea of exactly what would constitute "living well." "We are always living unto the Lord, either well or poorly." This statement really made me think. Every moment, we have a choice. We are either living unto the Lord well, or we are doing so poorly. The possibility of a qualitative difference in our living means somewhere along the line there is a judge of our performance, for quality infers a performance review of such quality. Many of us work in industries where such performance reviews are standard. As nurses, we each have a review of our performance each year. Additionally, our patients can send back surveys of how they perceived our performance and the performance of the hospital to meet their needs. Often if the patient is particularly impressed with the nurses, they will name them in the survey. This is something the nurses look forward to seeing. As Christians, we each have an appointment for our own "performance review" regarding our lives. It will review whether we have lived "unto the Lord" either well or poorly, as the preacher said. What could be "living well" more than living unto to the Lord well? enter thou into the joy of thy lord." For those of you who read both this blog and my husband's devotional, "The Special of the Day. . . From the Orange Moon Cafe," you will have noticed Friday we both wrote about the same topic, a man we had met the day before named Alfred. The parallel blog posts are interesting. They were written about the same topic. They were written at the same time. We were both sitting on opposite ends of the same couch in the same room as we typed our respective posts. But neither of us knew the subject of the other's blogs until later in the day when we were running errands and Glen mentioned having written about Alfred. "I wrote about him, too!" I immediately thought of people who might read both posts, thinking we had coordinated our efforts, but that was not the case. We had not coordinated our thoughts, but Someone else had coordinated our inspiration. We have seen things like this happen over and over again throughout the years, especially in various services we perform. Perhaps someone will be scheduled to sing a song and will unknowingly choose one that fits perfectly with the speaker's topic. Often in our Tuesday services, I will read one of my blog posts and the post I have read will seem to underscore the words that Glen later shares. This coordination is not random or coincidence, it is the working of Holy Spirit in and through our lives. He lives in and through us and when we submit ourselves to His leading, He can coordinate the efforts of His children and dovetail them together to meet His needs. I could say that Glen and I both writing on the same topic was the result of "great minds thinking alike," but I would rather say it is the result of two minds being led by the One Great Mind. "And thine ears shall hear a word behind thee, saying, This is the way, walk ye in it, when ye turn to the right hand, and when ye turn to the left. " Sometimes in life you have moments where you know you are have just been blessed. Such is the case when you are in the presence of either Alfred or Gracie. Gracie is a little seven-year-old with the face of a cherub and a head full of bright red hair. She has a boundless smile and matching curiosity Gracie came to our Bible study with her mother for a while. Determined to hug everyone in the room at least once as soon as she entered the room, she was immediately designated the "minister of hugs." Gracie didn't have the usual standoffishness many school-age children develop because Gracie has Down's Syndrome. She is sweet-natured, out-going and loving to everyone. Everyone gets a hug and a beautiful Gracie smile. Her perpetual state of innocence keeps her in a perpetual state of loving. The same seems to be true of Alfred, although I have only met him once. As we were leaving the nursing care facility where we do services throughout the week, Alfred had just been wheeled outside by his caregiver to enjoy the beautiful spring day. Alfred is an adult, but his spirit and smile had the same childlike lovingkindness as Gracie's. Immediately upon seeing us, he stretched out his hand in greeting, told us his name and asked us ours. "God bless you," was his response and then he offered us both a hug which we were not foolish enough to refuse. Joy and peace and love radiated from his tender face and it was as if the sun had decided to glow from the center of his wheelchair. As we walked away, I told Glen that Alfred and Gracie remind me of the beautiful people humans actually could be. He said that they reminded him of the beautiful people the Lord is changing us into. I know there are some who would quickly toss those like Alfred and Gracie aside, considering them to be damaged and worthless, but I have to tell you there is more worth in one of Gracie's hugs or a moment of conversation with Alfred than there is an hours discourse with many learned and education people of the world. "But God hath chosen the foolish things of the world to confound the wise; and God hath chosen the weak things of the world to confound the things which are mighty." I have managed to spend more than my share of time in cemeteries, though not doing what you might think. I don't really go to "visit" graves of people I have known. In fact, I rarely go to a cemetery to see the grave of an ancestor. I do go to a local cemetery frequently, however, to locate and mark graves for military memorial services. Finding these graves are often very difficult as the grids of the cemetery plots don't match the more randomly placed actual tombstones. I commented to the cemetery director this year that some of the people we look for seem to "get up and move" from year to year, because we have such a hard time locating the tombstones each year. The truth of the matter is that at some point many of the bodies in those graves will "get up and move:"
One day the Lord will return and those who know Him, who are His children, will either be resurrected ("O grave, where is thy sting?") or will be raptured from this life ("O death, where is thy victory?") and together we shall meet our Lord in the air. When the sights and sounds, the shoutings and tumults of this life cry out to us that all is hopeless, let us remember we have the One Blessed Hope, and let us rest in His ever faithfulness. There are great days ahead. . . Welcome home children, Welcome home children! Here where I am you shall always be, Forever rejoicing with me! "Think on these things. . ."
The human mind is an incredibly amazing thing, capable of so much more than we even begin to realize. I think we often underestimate the effect of our thoughts upon our ultimate actions. In actuality, thoughts are the parents of our actions. It is rare that actions occur without some form of preceding thought . That being the case, our minds are a place we should guard very carefully. Yet, how often have I been guilty of just letting my mind run free? Just letting it flit about to whatever thought it may want to light upon at the moment?